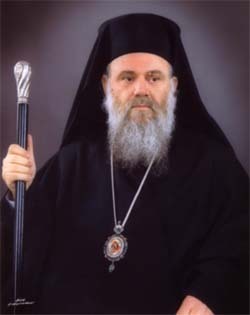 His Beatitude Hieronymos II, Archbishop of Athens and All Greece and Primate of the Autocephalous Orthodox Church of Greece, born Ioannis Liapis in Oinofyta, Boeotia, in 1938, is a graduate of the Faculty of Philosophy and of the Faculty of Theology of the University of Athens and holds degrees in Archaeology, Byzantine Studies and Theology. Subsequently, thanks to a Scholarship of the Greek State Studentship Foundation, he went on to pursue graduate studies at the University of Graz, the University of Regensburg and the University of Munich. Following a stint as academic assistant to the great archaeologist Prof. Anastasios Orlandos at the Athens Archaeological Society, he taught literature at the Lycée Léonin (Leontios School) of Athens, as well as at other high-schools in Athens and Avlonas, and was ordained deacon and then presbyter in 1967. After entering the clergy he abandoned his academic career.